It was wonderful speaking at Ed Talks tonight and sharing this great mission of providing access education to the poor. 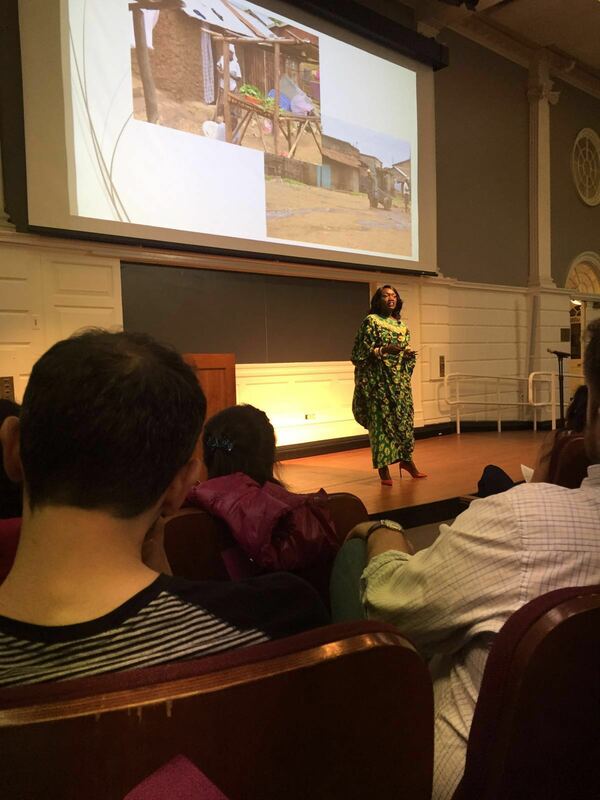 I got to learn about all the amazing work that my peers are doing around the world, as well as ideas that are incubating right at Harvard University. I am blessed to have the opportunity to be part of it all, representing the children. Akinyi Williams, Founder and Executive Director of Hope for the Child, has been invited to speak at The 7th Annual African Development Conference (ADC) titled “The African Renaissance" on March 4th & 5th at Harvard Kennedy School. Akinyi will be joining a panel of speakers on education, including: former Miss South Sudan Nok Nora Duany Bassey, Dr. David Moinina Sengeh President and co-founder of Global Minimum Inc. and Jonathan Starr Founder and Headmaster Emeritus of the Abaarso School. The keynote speaker for this event is Dr. Donald Kaberuka former president of the African Development Bank Group and Chairman of the Board of Directors. "It [the conference] invites conversations on how the continent’s potential can be realized and its growth sustained over the coming years. It will reflect on how to advance human rights, promote civic participation, and increase security. The ADC will explore the challenges of building infrastructure, navigating rapid urbanization, tackling climate change, eradicating poverty, and achieving gender and income equality. It will address models of good governance, access to quality education, health, and power, and other issues central to ensuring success and prosperity across the continent" (http://harvardadc.com/about/). Akinyi will give voice to the most unheard and the most impacted by the conference's developments, Africa's poorest children. Congratulations and thank you Akinyi! Further information re: the conference can be found at http://harvardadc.com . Many students overcame adversity to emerge champions, beating thousands of others from privileged backgrounds across the country. One such student from a poor family background who demonstrated that hard work and dedication overrides one’s family background is 12-year-old Murigi Wycliffe Gakenge. Gakenge a student from The Keen School, situated within Komarock estate Phase 3B, in Nairobi garnered 425 marks emerging the top pupil in the school. Raised by a single mother, Gakenge was born and raised in the crime ridden Kayole estate – Stone City area. Owing to the fact that his mother, Hellen Murugi was unable to pay her school fees, he attended four different primary schools. “There was a time when he was forced to stay back home for a whole term as a class five student after being chased from Calvary school in Kayole,” says Murugi, a struggling second hand clothes vendor, who revealed that her meager income is hardly enough to put a decent meal on the table, leave alone paying school fees for her only son. But luckily for the boy, he managed to secure a place at Keen School as a class six pupil where most times his fee was catered for by the school. Despite the difficulties, a committed Gakenge who aspires to be an electrical engineer would often wake up at 5 am in the morning in order to walk to school and return home at about 8 pm. “I was not discouraged by the long distance to school. I did not let the crime prone and dirty alleys through Kayole kill my dream for an education,” said Gakenge, when we caught up with him for an interview. To fulfill his intent, the dazzling sharp boy with big dreams survived hardship to create room for a bright future for himself. His spirit was however not killed by the unfriendly environment he is staying -an aura where teenage pregnancies, alcohol and drugs are the rulers of the day and night. “It is patience, resilience, hard work and support from teachers that have kept me going. If I get a sponsor I will work tirelessly to make it in life,” says Gakenge whose choice of high schools were Starehe and Mangu high schools. “I do not want to end up like many young boys out there whose future have been ruined due to the fact that they did not get the chance to further their education,” the shy and seemingly reserved teenager adds. Gakenge’s school registered 19 candidates during last year’s KCPE and had a mean score of 332.36 – it’s highest ever since 2010. To illustrate the school’s good performance, the number of students who scored 300 marks and above were 12 while those who scored between 285 marks to 300 were seven. According to the head teacher, Moses Owino Otiende it has taken a successful teamwork and dedication on the part of the students and teachers to achieve the remarkable performance. “We only hope that our best student will not lose his place among the best schools due to poverty,” he said. “I do this, particularly for students who I feel have a bright future but no one to assist them. As for Gakenge I saw the potential in him judging by his past performances and knew that he was going far hence my decision to assist him,” said his former head teacher, Moses Owino Otiende. Raised by a single parent the boy knows he must continue to move on and embrace faith to avoid succumbing to temptations which have been part of his difficult journey. Although he labored to be among top best performers in the country in 2015 KCPE and is sure to earn selection to join prestigious national schools this year, fears that he may miss his place among the cream of the society loom large.